On the tail end of a fantastic week of sunshine we were rearing to go for the 2012 Lowland Games, not to be confused with the other sporting events taking place in London this month! We were pleased to finally have the weather to trial our two delicious iced-teas (Lemon and Ginger with Elder Flower and Early Grey with Lemon). Freshly brewed and served over ice. On arrival we could tell we were in for something special, the programme was jam packed with ‘sporting events’ throughout the day. The Lowland Games kicked off with a round of raft racing, several of the rafts being ‘bodged’ together less than 24 hours prior to their maiden voyage (these were predominantly the vessels that sunk!). Several (smug) professional teams cruised to the finish line with minimal water damage. The event was wrapped up with an announcement over the loudspeaker… “we have confirmation from the environment agency that the water is stagnant!”. Eeek! Shortly after the raft racing there was a mad rush for “anything hot!” – the Lemon and Ginger being a firm favourite and a chocolate brownie providing the much needed energy for the proceeding events. 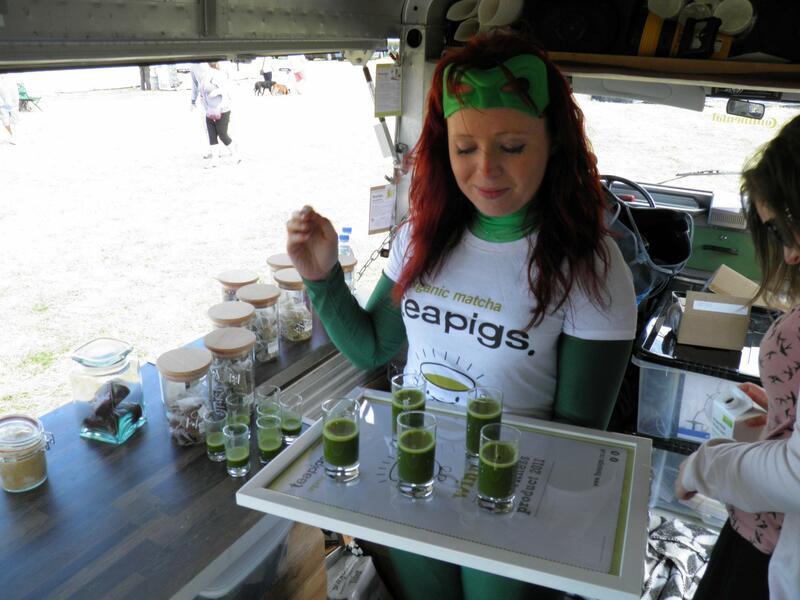 We were blessed with the company of two additional teapigs staff (Hayley and Amie) who were promoting the benefits of Matcha – the super powered green tea. Hayley aka the Matcha Man was kitted head to toe in what looked liked Mrs Green Lantern‘s pyjamas. Matcha in a variety of forms (hot, cold shot or with apple juice) proved popular amongst the contestants, especially with the winners. Wife Carrying (sponsored by teapigs Matcha) and mud wrestling were extremely popular with the public drawing in the biggest crowds of the day. One of our personal favourites was the ferret racing even though our 20p bet on ‘Yellow’ returned zero. In addition to a plethora of whole leaf tea (both hot and iced) there were hog roasts, high quality ice-creams and organic local cider available to purchase throughout the day. It is great to see event organisers taking pride in the services they offer to customers. It was great to see the public coming together to support local events and we hope that the Lowland Games will be back in 2013 – we would love to be there.